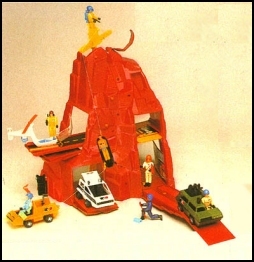 "The Mobile Action Command Rescue Team"
1978 and were similar in articulation to Star Wars and GI Joe figures. known as the MAC Commander, a few pieces of equipment and the appropriate rescue vehicle. are hard to come by but a complete MAC Mountain is the hardest. Just wanted to say THANK YOU for the info you have about MAC (mobile action command). I found this site from a reply on a message board that the google.com search engine pulled up. Until now I was never able to find anything about them at all on the net, aside from auction sites. I still have a ton of the figures and equipment. I did want to mention that you have the collection listed as being from 1974-1978 and I have some pieces in my collection that are dated 1973 and I could swear one was dated as 1972. In the early-mid 80's at one point the "Kaybee" toy outlet started selling some items from MAC long after the collection dissapeared. These items were mainly the small helicopters and jeeps (those weird small "vans" were a guy could fit in with a stretcher in the back laying down). Some came with figures and some didn't. The items were sold in bags stapled to a small cardboard header. They did not have the name MAC on them at all. They were around for a very short time then gone. I'm assuming it may have been a "warehouse find" so to speak so they shipped what was left to the stores.